· Forty years ago, most of our beef was dry aged. In the early 1960's the process of vacuum packing beef became the norm for most processors. · The advantage of this process was that they could "wet age" the beef in the bag and not lose any of the weight of the beef. Wet aging was much more cost effective for the processors so a weaning of the consumers' taste buds began to occur. Slowly, the consumer forgot what the real taste of steak was. · Beef is aged for 14 to 21 days. During this process a crust forms on the outside of the loin, very similar to the texture of beef jerky. This layer is trimmed away, leaving steaks that are superior in tenderness and flavor. During the dry aging process, the juices are absorbed into the meat, enhancing the flavor and tenderizing the steaks. · Research from major universities, including Kansas State University, indicates the enhancement of flavor and tenderness occurs in this Dry Aging process. 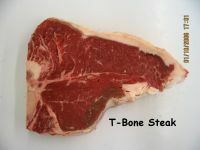 Dry Aged Steaks are very popular in the fine, white linen steakhouses on the coasts. · The dry aging process takes special care and requires a relatively large inventory. It is very time consuming and expensive, requiring extra effort, storage and high-quality beef. · Up to 4% of the original weight is lost during the dry aging process. This is why dry aged steak is offered only in fine restaurants, upscale grocery stores and gourmet steak companies.